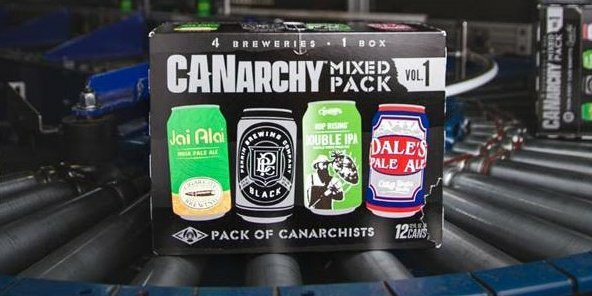 The CANarchy Craft Brewery Collective continues to tinker with new concepts to promote and grow the breweries in its portfolio. CANarchy (currently comprised of Oskar Blues Brewery, Cigar City Brewing, Perrin Brewing Company, Squatters Craft Beers, Wasatch Brewery, Deep Ellum Brewing Company and Three Weavers Brewing Company) is launching a new brewpub concept in Asheville, N.C., dubbed The CANarchy Collaboratory that will celebrate experimentation and collaboration in beer, food and culture. The concept will land in the Lexington Avenue Brewery (aka LAB) space in March 2019. As the name implies, The Collaboratory will specialize in cutting-edge flavors and brewing methods; as well as creating limited-edition, small-batch collab beers from leading craft breweries both in Asheville and throughout the country. The space will also feature projects between top chefs, artists and musicians across the Asheville community. CANarchy plans to invest in significant renovations to the current layout that will allow for increased seating and brewing capacity. “We feel that collaboration and innovation are essential to the future of the craft movement,” said Matt Fraser, President of CANarchy. “CANarchy was founded as a collaboration between like-minded brewers dedicated to bringing high-quality, innovative flavors to drinkers in the name of craft beer. So collaboration is very much in our DNA. The Collaboratory will be led by Wayne Wambles of Cigar City Brewing. Known and respected as one of the most progressive brewers in the world, Wambles looks forward to The Collaboratory as the next challenge in his esteemed career. “Having brewed well over one hundred and fifty collaborations in my career, I know the value that those projects bring to both drinkers and brewers. It’s a mutual exploration of culture, raw materials and process that exceeds the act of simply breaking bread with friends and colleagues. The Collaboratory will be a platform for innovation through collaboration, whether local, national or international; plus, it will allow us to innovate with our own in-house brands and projects among breweries within CANarchy,” Wambles said. The Collaboratory will open in March 2019. Opportunities for employment will be announced as they become available after the new year.